This file will explain how to connect between computers over a computer network using a remote login so that you can administer a machine remotely. You might also connect between computers to transfer files, but that isn’t the focus of this document; see File Transfer for that. Most systems administration is done using remote login to a remote computer through a network. Rarely are you actually sitting at the console/keyboard of the machine you are managing. Usually, you connect to the machine remotely over the network, using its DNS Name (e.g. 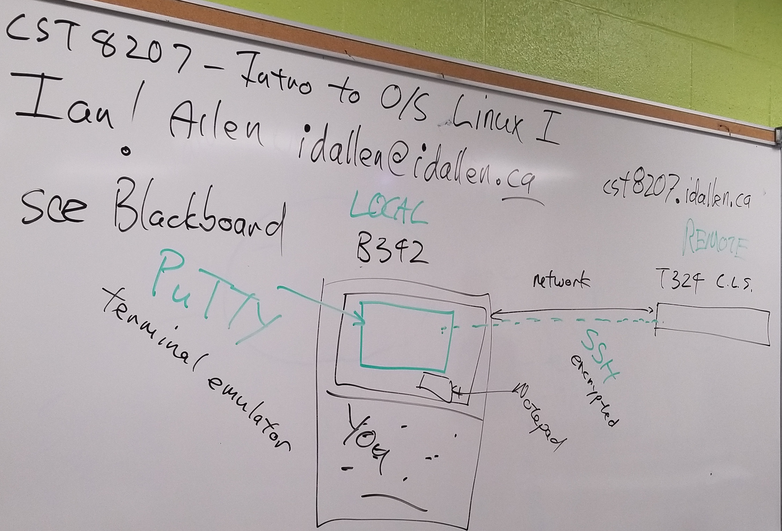 cst8207.idallen.ca) or, if the machine doesn’t have a DNS name, its IP Address (e.g. 205.211.77.51). Your Machine: The local machine you are sitting in front of. The Managed Machine: The remote machine on the network. Your first task is to select a remote login program that will let the machine you are sitting in front of (the local machine) make a secure network connection with the machine you are managing (the remote machine). The SSH Protocol: To manage Unix/Linux servers, the connection will use the SSH text-based communication protocol. This protocol is used to create an encrypted, text command line connection (no graphics) between your keyboard and screen and the remote machine. On Apple Macintosh use the built-in Terminal application and the built-in command-line ssh program inside the Terminal. If you are running Microsoft Windows, download and install the above software to be able to do Remote Login. You will also need to configure the terminal program and save your settings, as described in Course Linux Server. When you run your Remote Login program and use it to connect to a remote machine, you create a connection between your local keyboard and screen and the remote machine. In this connection, the characters that you type on the local keyboard are sent over the network to the remote machine, as if you were sitting in front of that remote machine and typing directly on its own keyboard. The text produced by the remote machine in response to your typing is also brought back over the network to appear on your local screen. Anything you type into this Remote Login program goes to the remote machine, and the results come back onto your local screen. If in the Remote Login program you issue a command to create or delete a file, you create or delete the file on the remote machine, not the local machine. If in the Remote Login program you issue a command to copy a file, you make the copy on the remote machine, not the local machine. Nothing you type inside the Remote Login program normally affects the files on your local machine. All the typing goes to the remote machine and changes the files there. It is as if you were sitting in front of that remote machine and typing directly on its own keyboard.